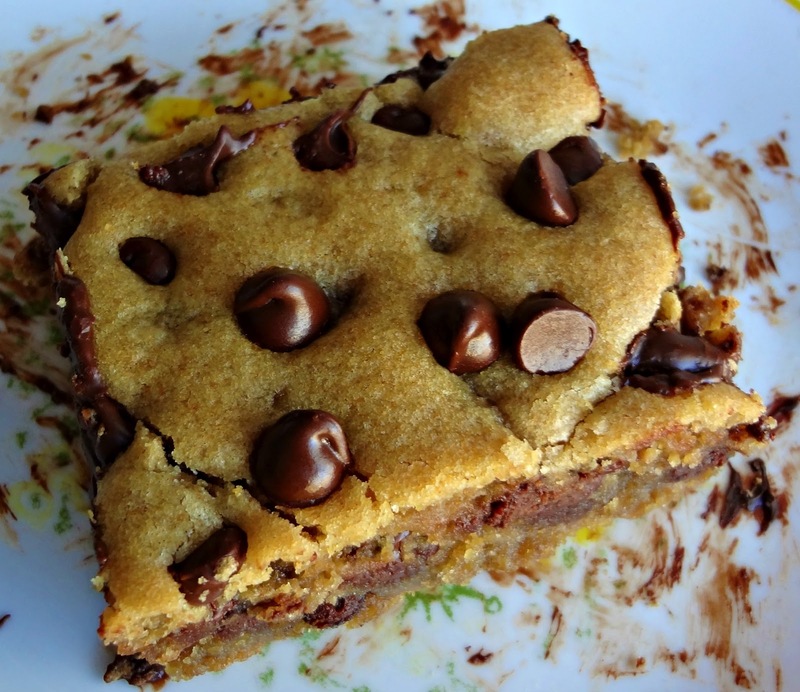 These cookie bars are so gooey and decadent, you really can't tell that anything about them is less than sinful. It's a perfect way to serve something a little healthier to a room full of kiddos (or a room full of one boyfriend, in my case). I'm not saying these are good for you by any means, however. Just, you know, a little less bad. These totally took me back to my childhood, and they're tasty as all get out! 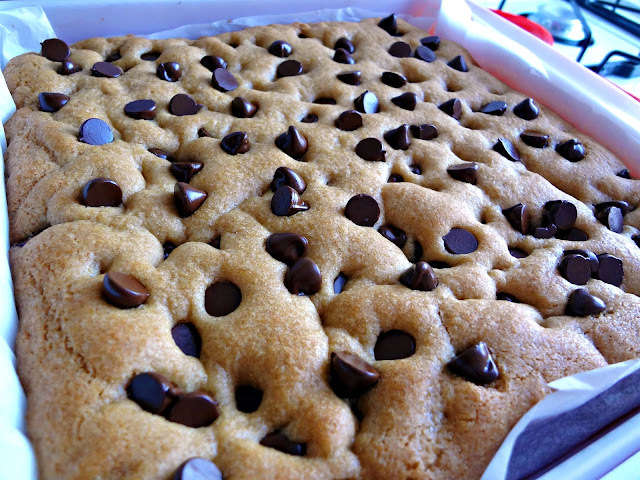 From Chocolate and Carrots "Whole Grain Cookie Dough Bars"
Cover a 9 x 9 pan with parchment paper. In a bowl, combine the flours and baking soda. In a larger bowl, using a spoon, stir eggs, sugars, canola oil, and vanilla until well combined. Stir in the dry ingredients until fully incorporated. Pour dough into prepped pan, making sure to spread evenly along the bottom. Sprinkle 1/4 cup chocolate chips on top. Bake 25-30 minutes, until a light golden brown. Let cool completely (difficult, I know), then cut. Oh, and stay tuned for Friday: I'm gonna share my favorite (healthier) pizza! The true success of this recipe is that you retained the delicious taste and cut back on the fat. I think that the change to whole wheat probably added a little nutty flavor to this and the oil kept it nice and moist. No butter?? Obviously not something that I would miss when eating these. Yum! Oh goodness. 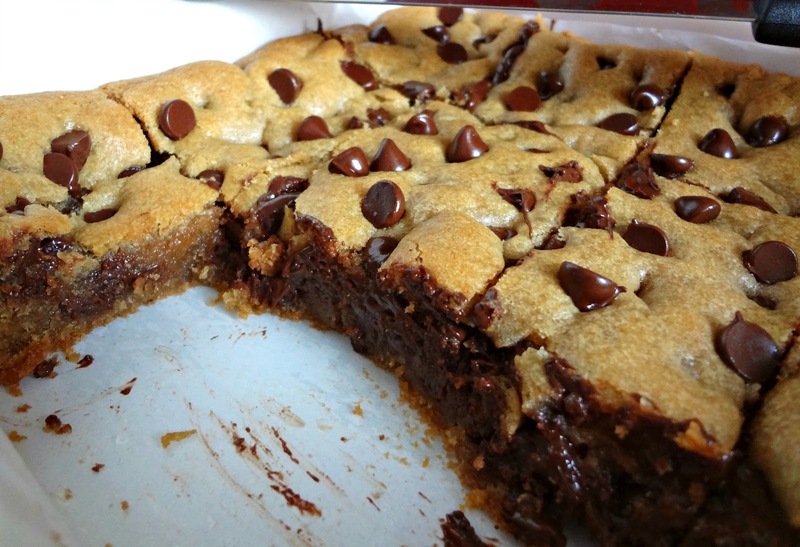 These look like ooey gooey heaven. I'd pair them with a big ol' glass of milk! OMG Kayle!!! 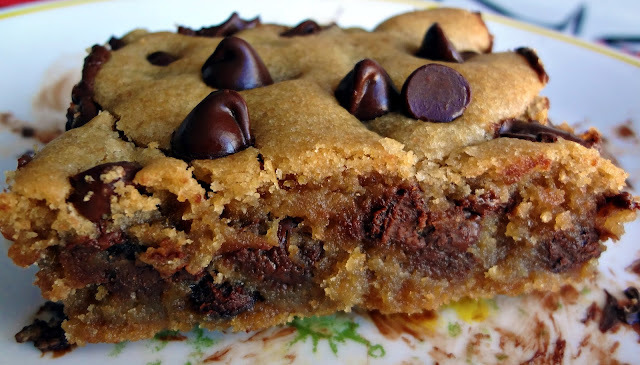 Oooey gooey deliciousness! Can I get four... er... one... with a big glass of milk? Yum! Ooh, all gooey and delicious looking! Omg, I want to dive right iiiin! I love the 1/2 cup of wholewheat flour making the death by cookie a bit more healthy. Have you ever seen or made a wholewheat crumpet? I keep meaning to do it myself but get distracted by all the other things i decide to cook. I haven't seen any whole wheat crumpets, but try googling it-I'm sure it's out there! Kayle I am SO making these! They look amazing! I bet the canola oil made them even more gooey and dense :) YUM!!! Love that you added whole wheat too! ok, i made chocolate chip cookie bars once before and they were all hard and not super great. and i thought, well maybe cookie bars just aren't as good as cookies. but these look sooooo sooo good and all gooey inside! i will definitely be trying this! These are def. gooey! Little secret though? Cookies are totally better. So i finally sat down to thank you for this recipe! I make this all the time and always turns out great! I make it with all 70% whole wheat, cutting down the flour to just a hair over 2 cups (about 2 1/8 cups.) Such a great recipe , thank you again! That's so great-I'm super happy that you liked it!